Area 51 IPTV: What is Area 51 IPTV and should you use it? Area 51 has become a very popular IPTV service. Supporters of the service say that it provides hundreds of channels for just $5, so how could a person go wrong? However, there are some questions regarding how Area 51 IPTV can turn a profit and whether or not it’s a case of « too good to be true”. Below, we dig into what Area 51 IPTV has to offer and whether it’s worth signing up for service. We will go into more extensive detail about Area 51 below. In general, the Area 51 app and Kodi addon may pose a risk, while the service as a whole has some answered questions, especially due to its low cost compared to the actual cost of offering the channels it provides. Some services offering IPTV in a similar fashion, such as Set TV and Fab TV, were both taken offline due to copyright infringement. This does not mean Area 51 IPTV will be as well, but there are many questions that exist because of those similarities. Because of these reasons, we do not recommend Area 51 IPTV service. Area 51 users will need to employ extra security and privacy protections when using the service, including taking steps to prevent ISP monitoring, hacks from malicious programmers, and other security threats. All IPTV services pose some security and privacy risks, and users need to be aware of these. If you are using an IPTV service, your ISP can log information about what you are watching and where you are streaming it from. It can also throttle your speed based on the mere fact that you are streaming video. If you use the Internet via public WiFi (in a coffee shop or gym, for example), hackers can also get into your device and steal passwords and credit card data. A VPN will encrypt the data you send to and receive from your IPTV service or any other website you visit, making it nearly impossible for your ISP to know what you are watching or even that you are streaming video. This will keep your streaming behavior private, help reduce speed throttling and increase protection against hackers. Of all the VPNs available, we’ve found that ExpressVPN is the best for IPTV users. It has apps for most TV devices, is lightning fast, and keep no logs of users’ activities. It’s an excellent means for IPTV users to protect their privacy while streaming. What is Area 51 IPTV service? Area 51 offers over 500 channels from a wide variety of countries, including the US, UK, India, Canada, Australia, New Zealand, Russia, Pakistan, and others. From the US, it has cable channels like SYFY, TBS, and truTV; premium sports channels like NFL Sunday Ticket and NBA Pass; and movie channels like Starz and HBO. From the UK, it has all of the BBC and ITV channels, Sky News, Sky Sports, and many others. The cost for this total package of channels is just $5/month. This $5 price tag includes the ability to stream on two devices at the same time. Additional devices cost extra. The Area 51 software can only be run on Android devices. There are no versions available for Apple TV, Roku, PC, Mac, or iOS. However, there is a Kodi addon that can be used to access the service on any device that will run Kodi. Should you use Area 51 IPTV? Area 51 operates a service that is similar to other IPTV services that have been taken offline, such as Set TV, Fab TV, and a handful of others. Those services were charged with being illegal pirate operations by various authorities. This does not mean that Area 51 IPTV is also running its operations in a similar way. However, there are many unanswered questions. First, Area 51 does not appear to charge users appropriately for the number of channels it offers. Instead, it charges users solely according to how many devices users stream from. For an IPTV service to operate, it must pay networks and copyright holders for the right to rebroadcast. This means that providing a larger channel package to users costs more to the service. Because of this cost, well-known IPTV services like Sling TV, DirecTV Now, or fuboTV, generally charge a higher subscription fee for their channel packages. This raises the question of how Area 51 has managed to offer these channels as such a low cost while other services charge more. Second, the cost of a subscription to Area 51 is so low that it is unclear how the company could turn a profit if it was paying for rebroadcast rights. For example, the Wall Street Journal has reported that ESPN costs TV providers over $6 per customer. Since Area 51 offers its entire package for $5, this implies that the service should be taking a loss of $1 per user just because it carries ESPN. All of the other channels it carries should be causing it to lose even more. In addition to these issues, there are significant privacy and security concerns associated with using Area 51. In order to use Area 51, users generally need to download a copy of the Area 51 apk file. However, a Google search for “Area 51 apk” currently provides a Google Play store result with nothing but negative, 1-star reviews in the top spot. These reviews say that the app is fake and will result in the user’s device being hacked if it is downloaded. In addition, the description of the app claims that it is a free service, which is clearly not true. Because search engines are leading users to these erroneous results, there is a high probability that many users will end up downloading malicious files while trying to find the correct one. This could damage users’ devices and cost them time and/or money. This problem could be easily solved by the service provider if it was to post an authentic copy of the apk file on its website. However, there is no link to an apk file on Area 51’s homepage, and the service provides no information as to where users can find an official copy of the file. Users can install a Kodi addon instead of the Android app to watch Area 51 IPTV. However, this Kodi addon is only available using a third-party repository that is not very well known. As far as we can tell, this Kodi addon was developed by someone unaffiliated with Area 51. If you would like to know some alternative IPTV services that are safer and more trustworthy, read more below. Here are some alternatives to Area 51 IPTV service. All of the following services provide official apps on their websites or in the official platform stores (Google Play Store, Amazon Fire TV Store, Apple TV Store, etc.). In addition, these apps have high ratings, positive user reviews, and no known complaints of malware or other security problems. FS1, beIN Sports Network, CBS Sports, History Channel, USA Network, Sundance TV, Fox Business, FUSE, POP, and many others. In addition to this basic package, fuboTV also offers an “International Sports Plus” package with five extra channels (Fox Soccer Plus, GolTV English, GolTV Spanish, Tyc Sports, Motorsport.tv), a “fubo Cycling” package with these same channels plus fubo Cycling, a “Sports Plus” package with 21 extra sports channels, and an “Adventure” package for outdoor enthusiasts. The cost for these packages ranges from $5 to $12 extra per month. All nine of the Showtime channels are also available for an extra $10.99 per month. It has apps for Roku, Apple TV, Amazon Fire TV, and Android TV. FuboTV will also run on any device that has a web browser. Your fuboTV login credentials can be used to unlock content from apps associated with any channel you are subscribed to. For example, the basic package will allow you to unlock premium content from the History Channel and USA Network apps. This is a distinct advantage to using fuboTV over Area 51 since Area 51 does not carry on-demand content. FuboTV offers a free trial for seven days, and the first month for new subscribers is $5 off the regular price. Sling TV is an IPTV service aimed at users who want a select few channels at a low price. It provides two basic packages that cater to different audiences. For users who want ESPN and Disney channels, Sling offers a package called “Sling Orange” that carries ESPN 1-3, Disney Channel, and 28 other US cable channels. For users who want NBC-owned channels, Sling offers a package called “Sling Blue” that includes NBC On-demand, NBC Sports, USA, SYFY, and 38 other channels. Regardless of which basic package is chosen, the cost is only $25/month. Additional channels are offered as part of add-on packages that cost $5-$10 more per month. For example, the “Comedy Extra” package offers MTV, MTV2, Paramount Network, CMT, Logo, Revolt, GSN, and TV Land for $5 extra per month, and the “Kids Extra” package offers Nicktoons, TeenNick, Boomerang, and BabyTV for the same $5 extra per month. Sling TV has apps for Apple TV, Roku, Amazon Fire TV, Android TV, AirTV Player, and Android phones and tablets. In addition, it can be used on any device that has a web browser. Like fuboTV (above), Sling TV can be used to unlock on-demand content from TV channel apps such as USA, SYFY, History, etc. Xumo is a free IPTV service that creates streaming channels by scraping videos from network websites. There are over 100 channels available on the service, including CBSN, MSNBC, Fail Army, The Pet Collective, People TV, HooplaKidz, Sports Illustrated, Futurism, and more. Xumo has apps for iOS and Android devices (including Android TV and Nvidia Shield). The Android app can be run on an Amazon Fire TV device, but must first be “sideloaded” using Downloader or a file manager app. USTVnow is an IPTV service aimed at U.S. military stationed overseas. It offers a free package that includes the New York affiliate of all of the U.S. network channels: NBC, ABC, CBS, Fox, PBS, The CW, and My 9. For $29/month, it offers an additional 18 channels, including AMC, Discovery, Fox News, FX, National Geographic, Nickelodeon, TLC, and others. USTVnow has apps for Roku and Apple TV. It can also be run using a web browser. 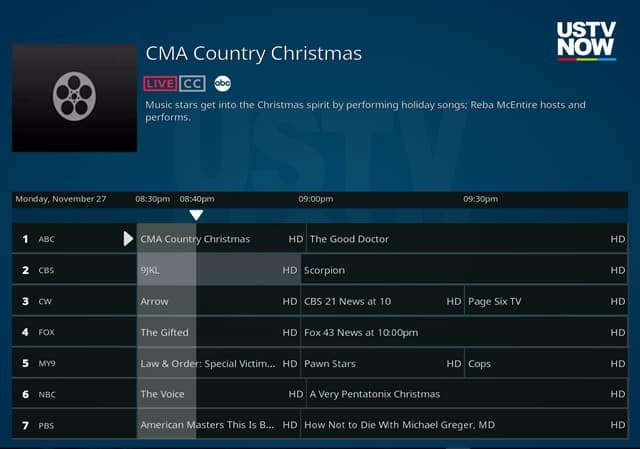 There are no Android or Amazon Fire TV apps available for USTV Now, but many Android/Fire TV users rely upon Kodi to view its programming. Although the above IPTV services work great for watching live TV, you may sometimes want to watch movies or shows that are not available live or are not even on the networks’ free apps. Here are a few great apps you can use to get even more on-demand content. Popcornflix is a free on-demand video service created by Screen Media Ventures. It offers a large catalog of movies, including horror movies, dramas, thrillers, romances, mysteries, westerns, family movies, and other genres of film. A few notable titles included are The Girl With The Dragon Tattoo, Zodiac, Short Term 12, The Hunt for Red October, School of Rock, and The Amityville Terror. Popcornflix is available on Roku, Apple TV, Amazon Fire TV, and through a web browser on a PC, Mac, or mobile device. Tubi TV has one of the largest catalogs of any on-demand video site, rivaling that of Netflix. It is ad-supported and does not require a subscription fee. Those ads can be bypassed if you use the Kodi version of the app. It has thousands of movies spread across many different genres, including foreign language films, cult classics, indie films, martial arts, thrillers, romance, sci-fi and fantasy, and many others. Its vast library includes Wayne’s World 2, Clear and Present Danger, Windtalkers, Bandits, World Trade Center, Hotel Rwanda, Showgirls, Chasing Amy, and many other popular titles. Tubi TV also has an extensive collection of TV shows, including Duck Dynasty, WolfBlood, The Dead Zone, Forensic Files, and more. The service is available on most TV, mobile, and PC platforms. It also has different content libraries in the US, UK, and Canada, but you can use a VPN to bypass its geographic content restrictions and gain access to the full library of content available. Crackle is an on-demand TV service owned by Sony. It has hundreds of films and shows, the majority of which are in high-definition. Notable titles include Talladega Nights: The Ballad of Ricky Bobby, Grown Ups, Robotech, Terminator: The Sarah Connor Chronicles, Resident Evil: Retribution, and Godzilla (1998) amongst many others. Crackle is available on most TV platforms, mobile devices, and personal computers, including Roku, Amazon Fire TV, Apple TV, Android, and iOS. Due to its large number of ads, we recommending you use the Kodi addon for Crackle which will skim out the ads for you. Viewster is a Swiss-based VOD service that specializes in gaming and anime content. Some of its more popular titles include Maricraft, Cromartie High School, Street Fighter: The New Challengers, and Beckii’s Life. Viewster is available on Roku, Apple TV, Amazon Fire TV, Android, iOS, and in a web browser.